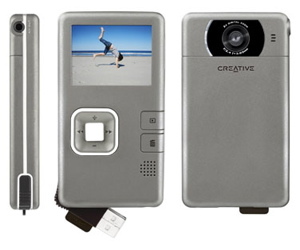 Offering a device for individuals to keep handy just in case a "must record" moment happens ("Don't Taze Me, Bro" moments), Creative has unveiled its VF0570-P Vado Pocket Video Camcorder. With 2 GB of memory, and 640 x 480 VGA MPEG4 videos recording at 30 fps, Creative's Vado has specs conspicuously similar to PureVideo's 2 GB Flip Video. The main difference between the two is the price. The 2 GB flip carries with it an MSRP of $149.99, while the Vado shaves the price down to $99.99. Complete with two AA batteries, the unit only weighs 84 grams and claims to be able to record for 2 hours in an even further reduced quality. Like the Flip, there is a built in USB connector, a 2" LCD screen, and an A/V out port. Though Creative and Pure both bill their devices as "camcorders," the quality offered is only marginally better than the capture quality on better mobile phones. Furthermore, a developing trend among point and shoot still cameras is the addition of HD video capture. Panasonic, Samsung, Kodak, and Canon all offer far superior video capture quality in a comparably-sized unit for only a fraction more money. In fact, Kodak's Easyshare V1233 is a 12 megapixel still camera capable of 720p HD video with an MSRP only $50 higher than the Flip Video 2G. It will not take a conscientious shopper long to find retailers that sell that particular camera for only $20 more than Creative's new offering.